The saying “an ounce of prevention is worth a pound of cure” definitely applies to litter boxes! Follow these simple rules to avoid many of the most common reasons for inappropriate elimination. You need to consider the number, size, and type of boxes. How many? The basic rule is a minimum of one litter box location per cat, plus one. That means if you have two cats, you should have at least three litter box locations. Many cats prefer to urinate in one box and defecate in another. In a multi-level home, you should have at least one litter box on every floor, even if you only have one cat. When it comes to litter boxes, larger is better. Even the so-called large litter boxes sold in pet supply stores are too small for most cats. The litter box should be 1-1/2 times the length of your cat’s body so that your cat has room to move around in the box and not have to step in soiled areas. We recommend using large plastic storage bins instead of commercial litter boxes. You can cut an entrance on one side to provide easier access. The high sides of these bins help contain litter when the cat digs and covers. Some cats, especially older and arthritic cats, can’t or don’t squat to urinate, and may accidentally urinate or defecate over the side of a smaller box; these bins eliminate that problem. Purchase clear or transparent bins, especially for multi-cat households. Cats are vulnerable when they are in the litter box, and it’s important that they can see what’s around them. You can bring us your own bin and we’ll cut and sand the entrance for you for a minimal charge. Drop off location is at Paws, Whiskers and Claws, in Marietta, Ga. If you decide to try cutting an opening on your own, you must use a Dremmel Tool with a heavy duty reinforced cutting disk. Do not use hooded litter boxes exclusively! The hood traps odors inside and, even if scooped every day, it will quickly become offensive to your cat. The hood also makes it easier for a cat to be ambushed if there is any aggression between cats. Note: A hooded litter box may be helpful if you have a cat that is shy about her toilet habits, but offer uncovered boxes as well. Even though we recommend large storage bins as litter boxes, consider providing a large shallow container as an alternative. For example, you can get an inexpensive 30”x30”x2” plastic drip pan (intended for washing machines) at Home Depot. These are ideal for arthritic cats. Electronic self-cleaning litter boxes may work for some cats, but we do not recommend them for a number of reasons. Do not use litter box liners. Cats generally don’t like the feel or the noise of these bags, and they actually create more mess than not using them because cats’ nails snag and tear the liners. Scented litter deodorants may irritate your cat’s paws and the scent is offensive to delicate feline noses. Placement of the litter boxes is extremely important. The litter box areas must be comfortable, convenient and safe. Provide litter boxes on every floor of a multi-level home. Do NOT place litter boxes in the same area as your cat’s food and water. You wouldn’t want to eat where you eliminate and neither does your cat! In multi-cat households, do not place the boxes in “dead end” locations (such as closets) that offer only one way out. If a cat feels threatened by another cat, the dead-end location may create an opportunity for her to be ambushed, and she’ll avoid using the box. 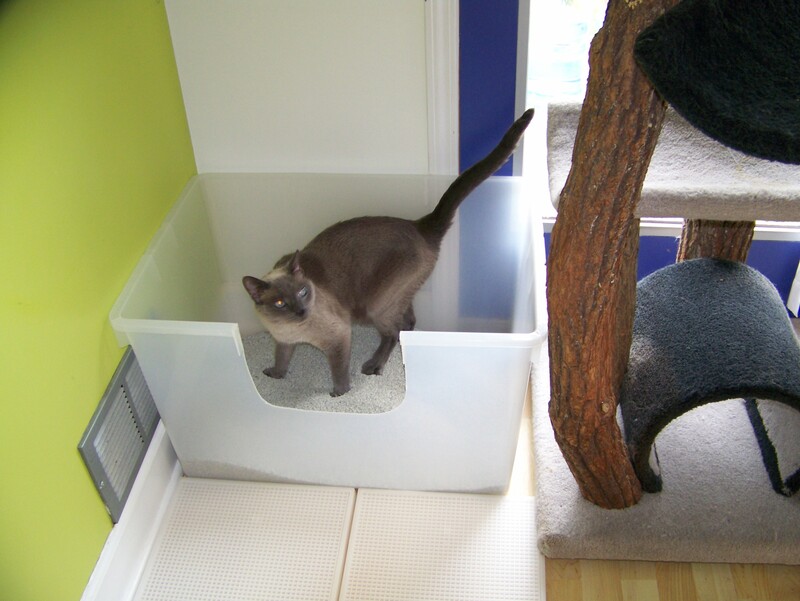 Place the litter boxes in open areas or next to a cat condo (see photo above) so your cat has the option to flee “up”. Avoid forcing the cat to use stairs or a cat door to reach the litter box because that can also lead to an ambush. Do not place litter boxes in dark, loud, or odorous places, such as the laundry room or near the furnace! Cats cannot see in the dark; there must be a light source nearby so that the cat can use the litter box at night. Nightlights work well. To keep other pets or small children away from the litter box, you can place a baby gate across the room entrance. You can raise the bottom of the gate a few inches off the floor to allow the cat to crawl under or jump over. If you have further questions or would like an evaluation of your litter box placement, please contact us. Remember to offer UNscented litter. Your cat’s nose is far more sensitive than yours. What smells “fresh” to you can be overwhelmingly strong to your cat, and may lead to litter box avoidance! Most cats prefer clumping scoopable litter over clay litter. Brands of scoopable litter differ in texture; you can experiment a bit to find the texture or brand that you and your cat like. (However, once you find a litter your cats like, avoid changing brands because sudden change can be disruptive to your cats.) You must scoop out clumped waste daily. We recommend Dr. Elsey’s Cat Attract litter. It is a clumping, scoopable litter that tracks less that other clumping litters. Cats prefer the size and texture, as well as the natural herbal blend (the scent mimics the aroma of soil and plant materials). You can use Cat Attract Litter Additive to any brand of unscented litter. We also recommend Dr. Elsey’s Precious Cat Classic Unscented or Ultra Unscented litter. A good alternative for geriatric cats is Dr. Elsey’s Senior litter. It has antibacterial properties which is especially helpful for seniors with chronic urinary tract infections. Dr. Elsey’s Kitten Attract is good for declawed cats as it is very soft. If you notice that your cat doesn’t bother to cover the urine or feces in the box, chances are she doesn’t like the type of litter you are offering. Clay litter box filler is recommended for kittens that might accidentally ingest the finer scoopable litter. You must empty, clean, and refill the box daily. We recommend the Publix brand unscented clay litter. Cats in the wild can chose from a wide variety of surfaces such as grass, pine straw, dirt, gravel, etc. You can provide options for your indoor cats too. While scoopable litter should be the filler in most boxes, you can offer alternate litter box filler in one or two boxes. Some cats prefer using a puppy-training pad inside a regular litter box. The pads are available in any pet supply store. Cats may use them for urinating as well as defecating. Remove the soiled pad, wipe the box clean, and replace the pad whenever it is soiled. Puppy-training pads are a great option for cats that urinate excessively. Pads may also be preferred by declawed and arthritic cats. Strange as it may seem, some cats prefer an empty litter box. They may not like the feel of anything under their feet except the smooth plastic box. Avoid alternate litter box fillers that have a strong odor, such as cedar or citrus-scented litter or recycled newspaper pellets. The texture of these pellets is not preferred by most cats, remember the softer the better in most cases. This also applies to the pine pellets and crystal litters; they are often not preferred. If you’re using clay litter, you must empty, clean, and refill the litter boxes daily. Don’t just scoop out the solid waste and stir up the wet litter; it may look better to you, but all you’ve done is spread the urine throughout the box soiling the entire box and making it offensive for your cat to step in. If you’re using scoopable litter, scoop each litter box at least once daily. Add fresh litter as needed to replace the soiled litter that was removed. Empty and thoroughly clean scoopable litter boxes at least every 1-2 months. Use soap and water and be sure to remove all traces of litter and soil, and then disinfect the box with a 10% bleach solution. Be sure to rinse the box thoroughly afterward to remove all traces of bleach! Be mindful of scented the cleaners you are using. Cats do not like the smell of citrus so use a mild soap such as lavender or honeysuckle, scents which are actually pleasing to cats. Keep the area around the litter boxes clean. You can place the litter boxes on a plastic runner, a vinyl tablecloth, or a short-knapped bath mat. These can be cleaned easily by shaking them outside or laundering them. You can place a tracking mat in front of the litter box. Be mindful of the texture that the mat provides. Many mats are spikey or made of fake grass-like textures. Many cats will avoid such mats and attempt to jump over them or just eliminate elsewhere. Nothing is foolproof. If you have cats be prepared to accept some level of litter tracking. Replace litter boxes about every two years, or more frequently if the surfaces become deeply scratched or stained. Use a Sharpie to mark the underside of each box with the date you purchased to help you keep track. There are many odor-eliminator products on the market, but the enzyme cleaners tend to work the best. We recommend Magic Zymes, Urine Off or Veterinary Strength Outright Stain and Odor Remover. We have found these products to be quite effective when used as directed. What If My Cat Starts Urinating or Defecating Outside the Litter Box? After medical reasons have been ruled out, you can start to consider the other possible causes. Read the handout “Coping with Inappropriate Elimination” for help in determining the cause of the problem and how to address it.